I love how blogging connects you with people who have like-minded interests all over the world, but nothing beats meeting people in person. 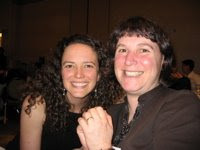 For the past two days I've gotten to spend time at the NetSquared Conference with my Co-Editor of BlogHer's Social Change, Nonprofit and NGO section, and fellow NetSquared blogger, Beth Kanter of Beth's Blog. June 11-12th we will both be speaking at the 2008 Making Media Connections Conference in Chicago. Beth will give a keynote about, "New Media: The Wizard Behind the Curtain," and teaching a session about, "Social Media Game for Nonprofits." I'll be teaching a "Nonprofit Blogging 101," and a "Nonprofit Podcasting 101" session. We'll also be at the, "Blogging Birds of a Feather Meet-Up: Green/Social Change" on Friday, July 18th at the BlogHer Conference in San Francisco along with BlogHer Green Editor, Green LA Girl. If you're going to be at either event, let us know! "What about creating a Facebook Changeblogger group which would be open to Changebloggers? It could be a place where we could share info, links, news and tips." So, I started a Changebloggers Facebook Group so folks have a place to connect, share resources, support each other and arrange online or face-to-face meetups. It will be fun to see what happens! Changebloggers List + Wanna Meetup? 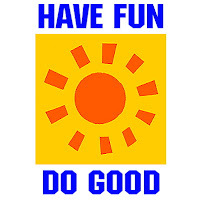 A couple weeks ago I asked you and the Have Fun * Do Good Facebook group for suggestions for Changebloggers, people who are using their blog, podcast or vlog to raise awareness, build community, and/or facilitate readers/listeners/viewers' taking action to make the world a better place. You all sent in a ton of great suggestions and many of you are interested in meeting up in some way. Below is a list of your Changeblogger suggestions, plus a few of my own. In terms of organizing a way for Changebloggers to meet and connect, what do you think the next steps should be? Should it be virtual, or in person? In one place or multiple? A conference or unconference? Lemme know and keep adding to the Changeblogger list in the comments of this post, by emailing me at britt@brittbravo.com, or using the tag, "changeblogger". Update 5/25/08: Based on an idea by Tim Zimmermann of Change/Wire, I started a Changeblogger Facebook group as a place for folks to connect and organize. Update 7/14/08 SocialButterfly has created a Changeblogger wiki where you can list your blog, Twitter feed, etc. One of the world's challenges that disturbs me the most is genocide. Perhaps it is because my generation was raised reading The Diary of Anne Frank and watching dozens of movies about the Holocaust. Over and over we were told, someone should have said something. Someone should have done something. If it happens again, you need to do something. But what can you do about a problem that seems so overwhelming? Can one person really make a difference? On April 15, 2008 I talked with Janessa Goldbeck, the Director of Membership at the Genocide Intervention Network, about what we can all do about genocide. 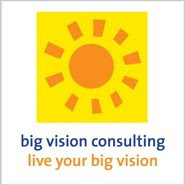 Below is an edited transcript of our conversation on the Big Vision Podcast. Janessa Goldbeck: My name is Janessa Goldbeck and I am the Director of Membership at the Genocide Intervention Network. The mission of the Genocide Intervention Network, or GI-Net, is to empower individuals and communities with the tools to prevent and stop genocide. Our members envision a world in which the global community is willing and able to protect civilians from genocide and mass atrocities. As part of the anti-genocide moment, we raise both money and political will for civilian protection initiatives around the world. Some of the programs that we have currently running are the Sudan Divestment Task Force, which is leading up the campaign to divest state pensions from companies doing business in Sudan on a recently passed Federal legislation to ban future state contracts. We also have a student division: STAND, which has more than 850 chapters around the world, and the students in those chapters actively organize and mobilize their communities and schools to pass legislation, to fundraise, and to really make more noise about genocide in Darfur and genocide in general. As part of the Genocide Intervention Network's general membership, the student division is very vocal piece, and we also have our adult and community members who are out there in the field, in the weeds, organizing their elected officials to do more work on genocide. Britt Bravo: Why should people care about genocide? If someone asks you, what is my connection? It is all so far away, it doesn't really affect me, it is very sad, but there are a lot of problems that affect me more. How would you answer that? Why is it something that everyone should care about? JG: I had the opportunity to spend some time in Rwanda when I was in college, and what really struck me about that experience was the willingness and openness of the survivors, who are both victims and perpetrators, to heal their country and to move on. I was really moved by the humanity of the people there. People wanted to ensure that genocide never happened again and they were willing to forgive and try to heal to make that happen. I thought that if people who have been through that kind of horror can display such depth of human understanding and compassion, when genocide happens in Darfur or anywhere, I feel it is my moral obligation to do everything in my power to stop it. I know it sounds cliché, but as Martin Luther King said, "Injustice anywhere is a threat to justice everywhere." I think from a practical perspective, genocide and instances of mass atrocity really are a threat to people everywhere. Genocide and genocidaires, people who commit genocide, are destabilizing to their country and to the world at large. If the US acted early on to prevent instances of genocide from occurring, we would save ourselves millions of dollars in relief and peacekeeping equipment. For example, since 2005, the US has allocated over $4 billion in humanitarian and peacekeeping and development assistance to the people of Sudan and Eastern Chad. Instead of being reactive, we can be proactive, and work to be a government that prevents genocide. It is in our best interest, and in the interest of those who are victims or suffering in places where their states or governments have failed to protect them. BB: Can you give an example or tell a success story of how an individual, or a small group was able to make a positive impact to prevent, or to work against a genocide that was happening? It is such a large issue and people I think often feel paralysis and overwhelm. If you had some example of how a person or a small group's action could make a difference, that would be great. JG: I think that change always begins with one or two people getting an idea into their heads and really feeling committed and being able to say, "This is something that we care about and we are going to make a difference, even if it is the smallest difference." My friend and colleague, Adam Sterling, was a 21-year-old student at UCLA when he first heard about the genocide in Darfur, and then he was outraged and decided he had to act. So, with a friend, and the help of his parents and teachers and community leaders, he began a campaign to divest the state pension system of California from the worst offending companies doing business in Sudan. His campaign was successful. Governor Schwarzenegger signed the California State Divestment Bill into law, and from there Adam took the campaign nationally. Now the Sudan Divestment Task Force has divested over two dozen US states, 50 universities, more than 15 cities, and placed Federal restrictions on Sudan linked investments. There are campaigns going in over a dozen countries, and at least 10 major corporations have ceased operations in Sudan, and significantly changed their behavior in the countries. This all started with one guy in Los Angeles thinking, "I have to do something." I think that that is a really tangible example of the power of an individual to take something into their own hands and say: this is morally wrong, this is something I have to take action on, and I am going to figure out how. BB: When did you start working for Genocide Intervention Network because before you were working for STAND, and now they are together . . . how does that work exactly? JG: STAND is the student-led division of the Genocide Intervention Network, and both organizations were started by students right around the same time. The Genocide Intervention Network was originally founded by a few students at Swarthmore College, and STAND, which was originally Students Taking Action Now: Darfur, was formed by a group of students at Georgetown University. Both organizations had a similar mission and vision to build a world in which genocide was not allowed to take place, and where US citizens held their government accountable for taking action to stop it and prevent it. In 2006, the two organizations came together with STAND remaining as the student division, and GI-Net working with adult community members, and going forward from there as one organization. I came into it when I was a junior at Northwestern University, and I was living in New York at that time. My friend told me about a rally that was happening on the Washington mall. This was in 2006. I have never really been one for rallies, or protests. I don't really like large chanting crowds, but I decided to go. When I got there, I found out that there was a lobby day. It was being sponsored by the Genocide Intervention Network. I had never lobbied before. I was wearing a pair of torn jeans and I had a suitcase and a skateboard with me, but I went to the lobby day and I got trained on our ask, and what we were going to say, and I ended up leading my delegation. I'm actually from San Diego, so I was leading a delegation to Senator Feinstein's office. I went in, and I was so nervous my hands were sweating, and everyone else was in suits and ties, and I felt totally casual, and really out of place. We sat down at the table with Senator Feinstein's foreign policy legislative assistant, and I gave the spiel. My hands were shaking and I was really nervous. And at the end of it he said, "Well this has been great, thank you so much for coming. She's been looking for a way to get involved and we're going to take these asks back and see what we can do." We followed up a few weeks later and the Senator ended up becoming a major sponsor and a big supporter of the movement. That to me was a sort of light bulb moment where I realized that there actually was power in advocacy, and that individuals like myself, with no real experience, just an interest and a passion to make a change, could actually make a difference. That's how I got involved initially. That sparked the passion in me and I applied for a position on the STAND leadership team. I first worked as an outreach coordinator for the Great Lakes region, which is six states: Illinois, Ohio, and a bunch of others around there. From there, I moved into the position of National Outreach Coordinator. STAND at that time was a student-led organization. It was a group of students all over the country working together to coordinate this national movement. We were sort of growing rapidly at the time. After I graduated, I decided that this was work that I really wanted to keep doing so I took a position as one of the two staff people at STAND, and now I'm really excited about working with our adult membership to help build and coordinate a larger, more effective anti-genocide movement amongst our community members and community leaders. BB: When you were working at STAND, you and the team there helped the organization to expand very quickly in two years to 850 schools. I'm wondering if you can talk about how you did that, what worked, and how some of the things that you did could be replicated by other student groups who may have different causes, but also want to mobilize and create a national network of organizations among students? JG: I think it may be helpful if I explain how it works. There are a group of 10 students in STAND's managing committee, and those students come together every couple of months in Washington, D.C. to strategize and plan for the future, for the next couple months. They create all the campaigns and all of the materials. Everything having to do with STAND they create and produce themselves. It began with this group of 10, and then from there expanded, realizing that 10 people couldn't talk to every single school. We "hired" a group of 12 outreach coordinators who then took that on. I think one of the big key things that we learned early on was letting go, releasing some of the control. I think there is a big tendency in a lot of organizations that are doing advocacy work with grassroots to hold on to every little detail, and to ask people to do all of the same actions all the time, and not really listen to what people on the ground are saying or asking for. One of the fundamental principles behind the way that we organize is that our outreach coordinators are students themselves, and they're often chapter leaders on their campuses. So, when we're creating campaigns, or looking at our strategic priorities, and deciding how we're going to move forward, and how we're going to mobilize the grassroots to do more, a lot of the decisions that we make are influenced by what people on the ground are asking us for. That's a huge thing, just listening to the grassroots and allowing the grassroots to really be a part of the planning process. Everyone is an expert in his or her own community. People know what will work best in their neighborhood. The mission of STAND and of the Genocide Intervention Network is to give people the tools and information they need to best organize their own communities however they see fit. The ideal world would be one where everyone is in line with the same priorities, but doing their own things that will work best and most effectively in their communities. Our cause is extremely urgent and extremely motivational, a lot of people wanted to get involved, so part of our expansion was just due to interest. But I think the second key component was bringing in people who did express interest, and giving them a really large chunk of responsibility, and saying, "OK, you want to do something? Here are six states. Mobilize them to pass this legislation." People who had no organizing experience in the past took it on, and they learned how to do it. And that's really generated this sort of self-perpetuating cycle of people getting involved at really high levels that wouldn't necessarily have otherwise. BB: I'm very inspired by a lot of the younger people that I've worked with. I have a lot of hope that your generation is going to make the world a better place, and I'm wondering what you think, if you think that your generation comes with special things, or ideas, since you've worked so much with youth. JG: I think that every generation has the unique opportunity right now to really push for positive change in the way that we deal with mass atrocity and genocide, and just in the way that we conceptualize ourselves as "activists" or "advocates." I think this generation, the younger generation, understands that you don't need millions of people to get things done. You don't need a 100,000 person march on the Mall to make a change. In fact, that's almost the opposite of what gets things done now. Now you need a handful of people who are committed to your vision, and you need to believe that you can move the world. I think that we live in a highly individualized niche world now. Last year the Time Person of the Year was "You," the individual. People have all kinds of modes of expression that just didn't exist a few years ago, and I think it's about harnessing that power of the individual, and using it to bring people together, whether that's through social networking sites or Meetup groups, which is something that young people have really latched onto and hooked into, or whether that's sitting down and saying to yourself, my church, my group, how can I bring what I think will bring positive change to these people and mobilize them. Starting small and growing out from there. I think this generation gets it and believes change is possible, and that older generations, or generations before, are seeing that and are being inspired by it in ways that are bringing people together across generations that has never really happened before. In D.C., this past Sunday was the Global Day for Darfur. We had an event on the Washington Mall and then marched from the Mall to the White House to deliver a set of asks and a message to President Bush about doing more for Darfur. It was really cool to see because the march was organized by our student division, STAND, and there were hundreds of students there, but marching with them were grandmothers and parents and little kids. That's not really something that is thought of as a typical march or rally these days. When I think rally, I picture a bunch of young kids with torn jeans, not grandmothers. It is cool to see that happening. When we were lobbying for federal legislation, a bill called the Sudan Accountability and Divestment Act, which was signed into law earlier this year, our advocates were students, yes, but also teachers, reverends and rabbis. It's a really interesting cross-generational mix of people who have taken this issue to heart. They see this as a moral cause that they have to advocate for. I think that sort of thing is really inspiring. BB: This is heavy work that you are doing. How do you keep from getting burned out? How do you keep inspired and keep going? JG: The people I work with constantly inspire me: from a couple of 22-year-olds writing and passing federal legislation, to seeing students willing to be arrested in front of the White House to send a signal to their government. There is a lot to keep me going, and also knowing that our program, the Genocide Intervention Network, has a civilian protection program in Darfur that actually directly helps protect people on the ground. That knowledge keeps me going. BB: How could people who are listening, or who read a transcript of this, get involved with GI-Net and STAND's work? JG: Well, first thing is that part of our mission is to build political will here in the United States to end genocide, so building political will means building a constituency. If you want to make a difference, you should join the anti-genocide movement. If you are a student, you should sign up on standnow.org. If you are not a student, you should sign up at genocideintervention.net, and everyone can put this number into their cell phone. It is 1-800-GENOCIDE. It is a toll-free number that anyone can call. All you have to do is punch in your zip code, and you will be connected directly to either your local elected officials, or the White House. It is up to you. You will be given talking points and connected directly, and you can give that message yourself. I call once a week, and it is something that can easily be done. You can be at a dinner party. You can be just getting up in the morning, on your way to work. It's a great number to have in your cell phone, and on hand. BB: For people who want to become more educated about the issue, are there any books or films that you could recommend? JG: Absolutely. The first book that I would recommend reading is called, A Problem from Hell: America in the Age of Genocide. It is by Samantha Power, and she looks at all of the genocides that have happened in the past century, and looks at the information that world leaders had and the blockades to intervention. Why didn't the U.S. government intervene, say in Rwanda, or in genocides of the past? What she discovers in her research is that the missing component to action was a lack of political will. In other words, the cost of inaction was less than the cost of action because they didn't know what they were getting into. They wouldn't know if U.S. citizens actually wanted them to intervene, and it's a great case for building this movement, for building this constituency. If you are interested in understanding where our perspective comes from, that is a great book to read. A documentary that I would recommend; well, there are two. One is called Sand and Sorrow, and it's a film that really goes into depth on the Darfur crisis and the genocide in Darfur. That's a great introduction to the conflict, if you are interested in learning more about that. The other one that is coming out in May on DVD is called Darfur Now, and it follows six people who are somehow involved in the movement to end the genocide in Darfur. One of them is actually Adam Sterling, the colleague who I spoke about earlier in this interview. BB: Is there anything else that you didn't get to talk about that you really want listeners to know, either about GI-Net's work, or the most common misconception about genocide, or anything else? JG: I think that one thing that I would just add on is a little bit of information about our civilian protection program because it is really unique, and I don't think as many people are aware of it. When the Genocide Intervention Network was founded, it was originally called the Genocide Intervention Fund. The concept behind it was that there was this African Union peacekeeping force in Darfur that was severely under-funded, and really didn't have the capacity to fulfill its mandates to protect the people there. So, these students at Swarthmore decided well, if the U.S. government can't fund it, and if the UN isn't going to fund it, why don't we fund raise among private citizens here in the United States for it? With the help of a lot of experts and connections, they created a program where private citizens here in the United States can contribute to helping fund peacekeeping efforts directly in Sudan. Right now, we have three programs going. One of the biggest problems in the displaced persons camps in Darfur is a lack of firewood needed for cooking. So, what we've done is we're working with the United Nations-African Union mission in Darfur to set up peacekeeping patrols to go out with women outside of the camps to collect firewood, and the soldiers are there to protect them from raids and attacks. That's one thing. Another thing is an income-generating project where we provide them with chickens and sewing machines, and they are able to sell those items and have cash necessary to buy firewood in the camp market. The third thing is working with the United Nations-African Union mission in Darfur to help create training manuals for the soldiers so that they will all be on the same page when they go out on patrol because they are coming from all over the continent. It is the largest hybrid peacekeeping force in history, actually. These are all ways that people can contribute directly to protecting people on the ground in the camps and if your listeners or readers are interested in learning more they can go to genocideintervention.net/fundraise/cprotection and learn how they can contribute. According to Nonprofitist.org's post, How Many International Nonprofits Can You Count? there are 1.4 million nonprofits in the United States. Charity Governance reports that, "For the period from October 1, 2006 through September 30, 2007 (fiscal year 2007), the IRS received 85,771 applications for recognition of Section 501(c)(3) status." That's a lot of nonprofits, many that are doing similar work and competing for funding from foundations and individual donors. "The Collaboration Prize recognizes collaborations among two or more nonprofit organizations that each would otherwise provide the same or similar programs or services and compete for clients, financial resources and staff. The Prize also seeks to build an information base of effective practice models that can be studied and used by academics, nonprofit leaders and grantmakers to inspire and advance their work." "Involve two or more nonprofit organizations that each would otherwise provide the same or similar programs or services and compete for clients, financial resources and staff. Have a structure that is evidenced by a formal agreement that uses the resources of each party in a more effective way; this agreement could be a memorandum of understanding (MOU), a letter of agreement, a contract, or a merger agreement. Have begun operation at least 18 months prior to nomination and must have been in existence no longer than eight years prior to the date of nomination." The nomination process begins June 1, 2008 and closes July 21, 2008. I hope that one of the results of this award will be a guide and training to help other nonprofits to pool their collective knowledge, skills and resources in successful collaborations. As the Everyday Giving Blog points out, the authors of Forces for Good, Leslie R. Crutchfield and Heather McLeod Grant, found that "One of the six practices of high-impact nonprofit organizations is collaboration with other nonprofits." Why don't more nonprofits collaborate? Logo from The Collaboration Prize web site. On Saturday I completed the 29-Day Giving Challenge that I posted about last month. The process felt like peeling an onion. First I gave away money, then stuff, then advice, and then my giving became more intangible. I came to realize that, at least for me, the most difficult thing to give away sometimes is compassion for individuals I encounter in every day life. It isn't difficult for me to care and want to help a cause, or an individual entrepreneur on Kiva, or a reader who emails me for advice. What is challenging for me is to be understanding with the friend who is always down and complaining, the client who stalls my work by not replying to emails, or the customer service representative who reads from a script of answers in response to my complaint. I lose my patience, and sometimes I get angry. Thing is, you can sign petitions, make donations, organize rallies, and spread the word about do-good things all you want, but if you're not being kind to the people around you, are you really a changemaker? . . .
"Responsibility does not only lie with the leaders of our countries or with those who have been appointed or elected to do a particular job. It lies with each of us individually. Peace, for example, starts within each one of us. When we have inner peace, we can be at peace with those around us." On Day 26 of the Challenge I came across the Get Service video (above) about empathy. It is totally amateur and cheezy, but it made my blubber. I don't want to spoil it for you by describing it, but let's just say that when someone is getting on my nerves, and I remember to think of it, it helps me. "The finest pleasure is kindness to others--Jean de la Bruyère." Monday was Day 29 for BlogHer Editor Green LA Girl, and today is Day 29 for the Chief Family Officer. I'm sure they'll post their reflections in the week ahead. A Day Late and a Dollar Short and Dream Big! are about halfway done with the Challenge. Says Me, One Frugal Girl, Sarah Salway and Tragic Sandwich just started. PozVibes and Unclutterer are thinking about starting. It's time to expand my Changeblogger reading/listening/viewing list. If you have a favorite blog (or podcast or vlog) that uses its platform to raise awareness, build community and/or facilitate readers/listeners/viewers' taking action to make the world a better place, will you post the blogs/podcasts/vlogs' name and URL in the comments? I'll re-post the list of blogs/podcasts/vlogs you suggest on May 21st. Also, while having coffee with Chris Naff of HumanKindMedia yesterday, I realized there isn't a conference or meetup, or any kind of get together, that I know of (see update), just for bloggers, podcasters and vloggers whose main focus is to use their blog, podcast or vlog to create social change. Do you know of one? Would you like attend one? Lemme know . . .
Update: The We Media Conference is a gathering of, "companies and individuals committed to harnessing the power of media, communication and human ingenuity for the common good." Update May 23, 2008: Here is a compiled list of all of your suggestions: Changeblogger List + Wanna Meetup? 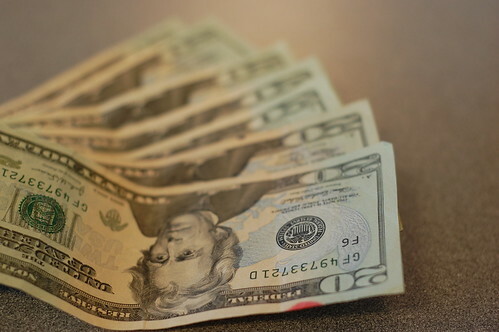 Will You Donate Your Economic Stimulus Check? FinancialAidPodcast suggests paying down your debt, putting it in a savings account, or donating to a charitable organization. They recommend giving to the United Nations World Food Program and America’s Second Harvest. Trista Harris of New Voices in Philanthropy thinks you should purchase goods and services from a local nonprofit. Harris is remodeling her home and is going to purchase some of the supplies she needs from the Habitat for Humanity surplus store and the ReUse Center. thejivefather is going to be donating as much of his economic stimulus check as possible to support musicians in need. He suggests donating to the Tipitina's Foundation, The Jazz Foundation of America, The Rhythm & Blues Foundation, Musician's Village, The Health Alliance for Austin Musicians, and the New Orleans Musician's Clinic. Flickr Photo Credit: Money uploaded by Jennifer R.